Because I run my business out of our entire basement (and all my very fragile inventory and soap making goodies are down there) we don’t have a dedicated play room in our home much to my disappointment. Right now Lachlan does most his playing outside because the weather allows for it but when the weather gets cold our main living level and his room become his only play space. I can only imagine as Lachlan and his little brother grow and change we may just outgrow the shared living/playing/eating/hosting set up we have now. 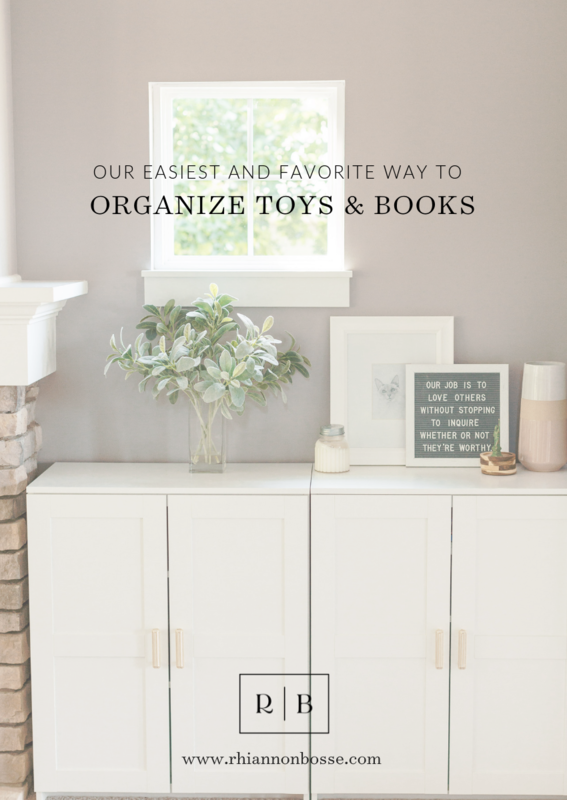 We’ve thrown around a couple different scenarios to help keep our home tidy and streamlined while still letting our son’s curiosity and ability to play to meld harmoniously with our desire for order and organization. While many of our ideas have involved more permanent changes, like building a different home and moving, some of our ideas involved changes that we’re just not quite ready to make; for financial reasons or otherwise. Like moving my business out of the home, ditching our guest room in favor of a play room, or even renovating existing parts of our home to add on or convert dead space into usable space. There are a lot of options we’ve explored in this arena! So earlier this year (ironically enough during an endless cold winter stuck playing in the living room with a busy toddler) I had an epiphany that perhaps the space we have to work with here isn’t the problem but maybe it’s not having a place to put everything that feels bothersome. Anything considered a toy used to just be placed on the floor against the wall in our living room and it always felt like an out of order, messy and chaotic set up fighting for attention in the same space we watch movies, spend time as a family, and host guests and family for holidays. It just didn’t work for me. And a home that works well is important. I thought if I could just have a system for storing the things we have and Lachlan loves, then maybe our rhythms would feel more seamless. And perhaps Lachlan would ultimately develop a sense of pride for his belongings, while also learning how to take care of and put away his toys and books when he’s not playing with them. We looked into a few systems recommended by friends but most were bin and basket style where contents inside were visible from the top. And I didn’t like that. Moreover, a lot of the popular name brand systems were upwards of hundreds of dollars for shoe-rack size set ups, and that was out of the budget. 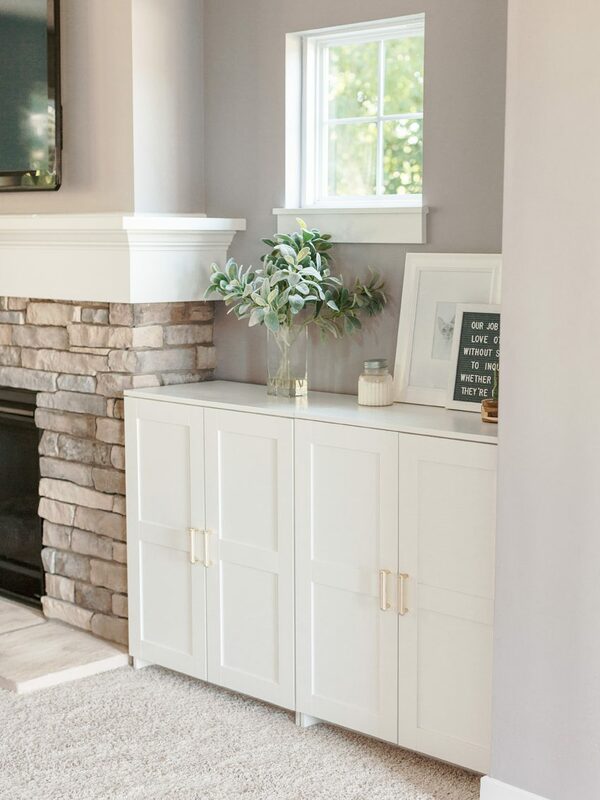 Finally, we tossed around the idea of having built-ins created on either side of the fireplace, something we wanted to do when we built our home in 2011 but wasn’t in the budget, but again, even seven years later, this still wasn’t in the budget. For months it felt like an endless cycle of talking about the corner toy situation in our home! Then someone mentioned checking out IKEA. And while IKEA can be a bit overwhelming (all of those pieces and endless assembly!) I stumbled upon the BRIMNES line and KNEW it was just what we were looking for. Like a lot of IKEA products, the pieces we selected are part of a larger customizable series of small and large wardrobes, chests, and more. But I was pleasantly surprised to find the series offered us just what we needed in the form of a mid-height cabinet with solid doors, a simple aesthetic and best of all, within our budget. The cabinets have been the perfect solution for us to help keep toys in a designated area, and more generally, allow our home to feel tidy (and tidy is most definitely different than clean so I’ll save the sentiment for a different day!). Below are some of my thoughts on the cabinets and why we love them so much! And to be crystal clear this is not a sponsored post by any means. I’m one small fish in a sea of many to IKEA. I simply love these cabinets and am happy to share why in hopes they might make a difference in your home too. 1. In the photos above you’ll see two separate cabinets which actually look like one seamless built-in. One cabinet butts up against our fireplace and the one beside it matches up right against our living room wall. In what might be my luckiest stroke of luck ever, the cabinets fit in this space like a glove without my measuring or even thinking it would have been wise to measure the space in comparison to the cabinet widths before purchasing and assembling (a big LOL there). However, they do fit perfectly and as a result, look like they are actually built-ins! They make the space they’re in (our open concept living room and front room) feel really curated and it looks like we have a custom look without the cost and fuss of actual built-ins. The extra space on the top of the cabinets is an added bonus and provides us with space we never had before that’s not kid-height. 2. The cost of the three cabinets was completely within our budget and very reasonable. At $95.00 a piece, for a set of three we spent under $400.00 (considering both taxes and pick up which we outsourced through a local company here since IKEA is 2.5 hours from us). We did the assembly ourselves, I scored some handles on clearance at Hobby Lobby, Andrew anchored the units to our wall, and voila! A functional, affordable, and beautiful solution to our little toy dilemma! Note: the third cabinet is not pictured here but on the other side of the fire place and does not hold toys or children’s books but instead my books, magazines, games and other items we don’t access on a day to day basis. Lachlan very rarely even goes over to that side of the room. 4. My final win feels a little superficial but I’m owning it! 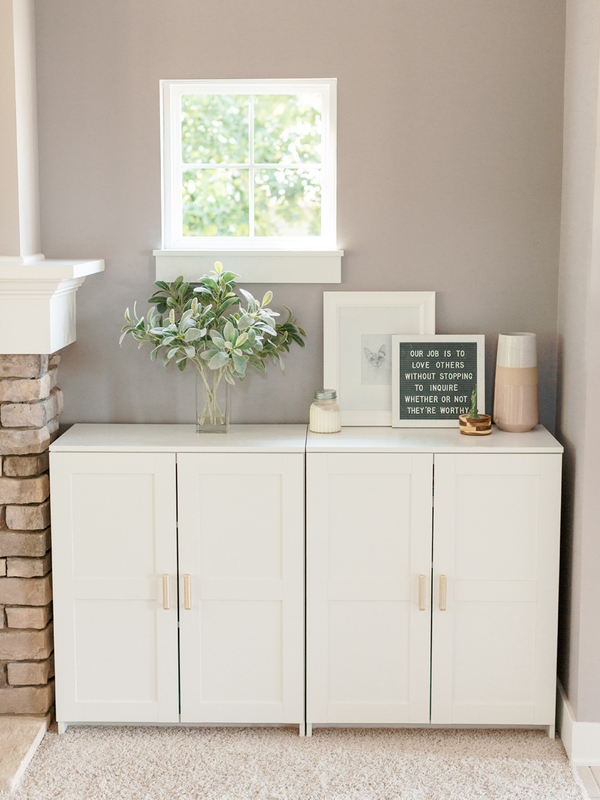 The cabinet doors we picked are solid, meaning when things are put away in the cabinets it doesn’t matter HOW they are put away because their tucked in and hidden. And I love that because I feel like I’ve just done a big clean up when really I’ve tossed everything into one of the two cabinets. It’s like the kids who throw their toys and books and clothes in their closet or under their bed to pretend they’ve cleaned their room. Out of sight and out of mind right? While every once in a blue moon I will organize the toys and books, or get rid of ones Lachlan doesn’t touch anymore, most of the time things are quite literally tossed into the cabinets, the doors shut on them, and all in the span of less than three minutes. I feel like these cabinets let the chaos be out of sight and mind when Lachlan isn’t playing. And when he IS playing, we’re doing it with him and the stuff everywhere is expected and encouraged! I’ll also add we have a built in bench right in the foyer of our entryway. With the exception of some throw blankets and decorative throw pillows, the bench also houses some of Lachlan’s goodies so he has more real estate here in the living room than just two cabinets! And finally, I’ll be following this post up next week with some of my other favorite tidying hacks in our home because I’m fiercely passionate about having a joyful and imperfect home that can serve a family intentionally but still look really beautiful and curated. love this! please can you tell me what size pulls you used to replace the standard white? TIA! I’m so glad my Brimnes cabinet suggestion on Facebook worked out so well for you! Our same system (set up before our daughter was born two years ago) works so well and keeps things contained! We do more baskets inside but just love the amount of storage these units provide! Yes! I feel like these would be excellent in your living room! A great place for your TV to go too, now that two kiddos are going to be playing and exploring in your beautiful space!